Weather as the ultimate force, which surrounds us all the time, gets more closely looked at by the three-part production ‘Wild Weather with Richard Hammond’. Assistant Producer Jo Harvey gives an impression at how filming in unpredictable conditions can still result in a happy ending. As natural history filmmakers, we often willingly put ourselves in the path of danger to bring home that one golden shot. It isn’t all egos and frivolity you understand, we are committed to furthering your and our knowledge of the world we live in. So, if you were given the opportunity to stand side-by-side with a force of nature so great that it kills more people a year than great whites, what would you do? Accelerating from naught to 80 in a matter of seconds, not even Bolt, the fastest man on the planet, can outrun it. As a filmmaker there is only one choice – to turn and face it. This is exactly what Richard Hammond and the team at Oxford Scientific Films did this past year in Davos, Switzerland. 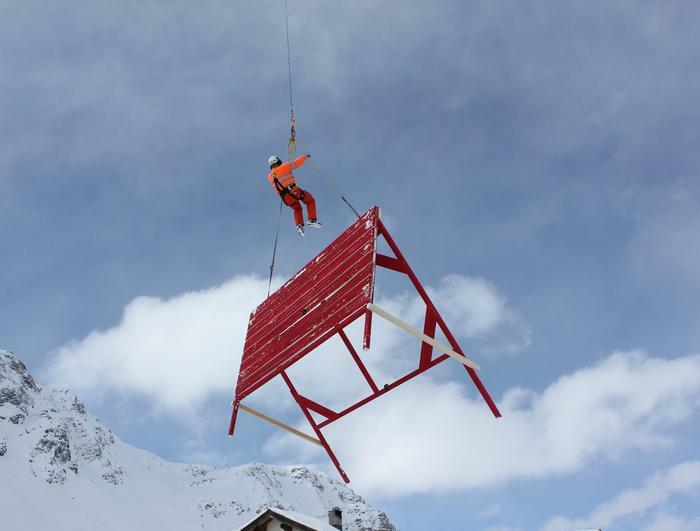 Davos is the home of SLF, the world’s leading authority in avalanche research. Together SLF and OSF (as well as danger we filmmakers love an acronym) brought together cutting-edge science with state-of-the-art technology, to show avalanches in a way they have never been seen before. 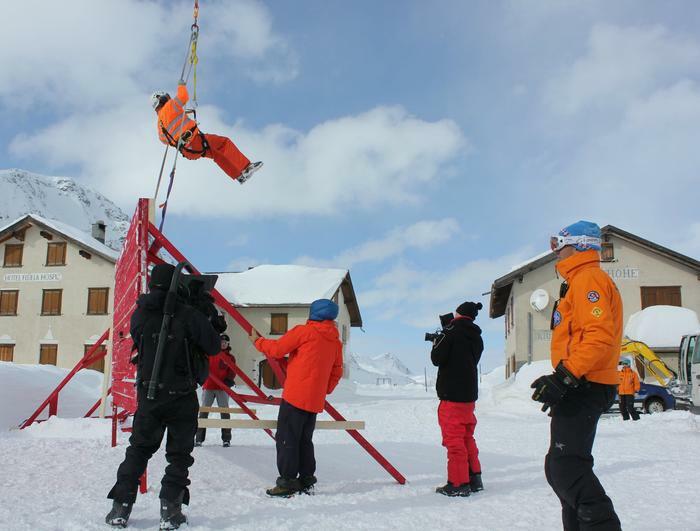 However, it wasn’t as simple as teaming up the world’s leading snow-brains with an award winning film crew. Mother Nature, as ever, had other ideas. It isn’t that we are naïve, or stupid, or both. It’s that hours and hours of research, thousands of pounds of cash and litres and litres of blood, sweat and tears go into getting a crew to location. To go home without that golden shot is incomprehensible. Standing by to capture this unique event were: two Squirrel helicopters; two high speed cameras capable of shooting 1,200 frames per second, expanding time so that one second is stretched to last almost one minute; two cameras able to resolve images more clearly that the human eye can see and a drone to shoot the avalanche from above. It is too dangerous for piloted helicopters to get close to the mountainside, because there is a risk they will get sucked into the snowpack as it cascades downhill. As filming day dawned and the sun rose over the snow-covered Alps, 12 members of the film crew and 50 scientists stood side-by-side at the base of the infamous Flüela Pass, willing the clouds to part. There we waited in sub-zero temperatures with frozen, baited breath. As minutes turned to hours our hope of triggering an avalanche was waning with the remaining daylight. In television there are no prizes for second place. At midday the gloomy silence was broken by our radios crackling to life. A clear front was on its way through the gap in the mountains that separates Davos and Susch… go, go, go. As our convoy of four-wheel drives began to climb to the reassuring chinking of snow chains, so too did our spirits. Finally the blue sky emerged from behind the clouds and our crew morphed into doubles from James Bond. Men strapped to huge fences dangled from helicopters, drones roared overhead, crew shouted to be heard over the gale force winds and then the euphoric blast of dynamite; the starter’s gun, the sound we feared we would never hear. The snowpack roared out of the starting zone, careered through the avalanche track and approached the run out zone in a matter of seconds. The snow’s behaviour, akin to molten lava cascading down the side of a volcano, or a dust storm racing across the desert. The common denominator is that these phenomena are literally feeding themselves. This entrainment of debris is what makes them so deadly. Without technology, these phenomena are gone in little more than the blink on an eye, leaving in their wake a trail of devastation. By rigging the snowpack with a whole host of sensors measuring everything from temperature to liquid water content, in conjunction with an array of cameras, we can relive this event again and again. Learning how man can more safely live side-by-side with this beautiful, but lethal force of nature will ultimately save lives. Follow this link to find out more about the production including a trailer of this visually stunning three-parter.